This Father’s Day, why not swap traditional gifts and spoil your dad with a whisky day out instead? If you’re stuck for ideas, fear not – we’ve looked far and wide to source some of the best Father’s Day whisky events taking place this Sunday (18 June), and they’re sure to make your old man feel special. Melita Kiely shares her top finds. Finding a gift on Father’s Day that tells your dad how much he means to you is no easy feat. So if you’re lacking inspiration for a meaningful present to give to your old man this Sunday (18 June), why not treat him to a whisky day out instead? There are all sorts of events taking place especially for dads this Father’s Day, from traditional tastings and food and whisky pairings, to blending sessions and even the chance for him to fill his own whisky cask – now that’s a pretty cool present. Scroll through the list below for more detailed ideas for where to take your dad this Father’s Day. If your dad’s been hinting that he’d like to learn more about Scotch whisky, then this Father’s Day whisky tasting at the Good Spirits Co in Glasgow will make an educational and enjoyable gift. The knowledgeable team at the spirits store will talk you through all things whisky and answer any questions you may have, before allowing you to sample a selection of six drams. 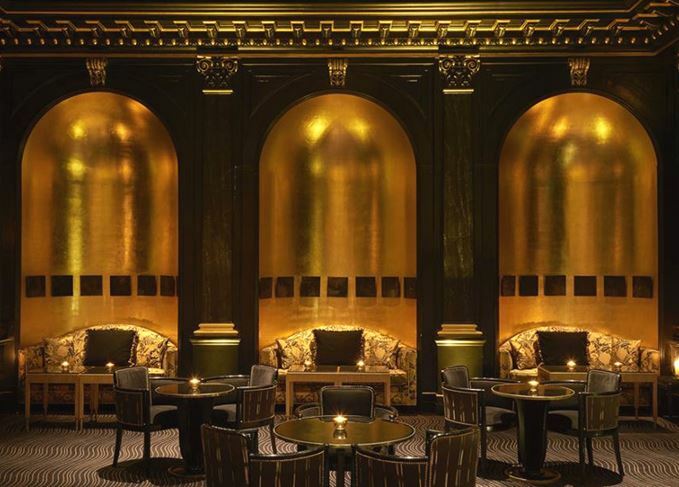 If you have a bigger budget to play around with and a father who’s partial to a whisky cocktail, then London’s five-star hotel The Savoy has a particularly special bottled tipple for you to try. The Age of Discovery barrel-aged cocktail has been on a 41,000-nautical-mile journey around the world, onboard Cunard’s flagship Queen Mary 2 cruise ship. The cocktail is a blend of Savoy Select Jack Daniel’s Single Barrel, Jack Daniel’s Old No 7, Bacardi 8, Spice Trail Madeira, Dubonnet, Martini Riserva Rubino, and Earl Grey and cocoa nib bitters. If your father’s as keen on his food as he is on his whisky, then the Scotch Whisky Experience’s sample menu at the Amber restaurant is sure to make for the perfect dining experience. Available on its own, or with a tour of the Scotch Whisky Experience before your meal, the menu changes on a daily basis depending on what local produce is available to the chefs. This year’s Father’s Day menu will include a trio of starters, three main course samples and a dessert matched with a dram. Dishes on Sunday’s menu include smoked salmon roulade, marbled game terrine, Inverurie sirloin of beef with crushed basil potato cake, hake with Cullen skink risotto, and sticky toffee pudding with vanilla ice cream. Your dad might be a fan of drinking whisky, but has he ever had the chance to blend his own? The Whisky Lounge is hosting blending sessions at 11 different locations across the UK, allowing insight into the world of master blenders. Each session will start with an introduction to whisky, complete with the chance to sample a selection of different styles. The Whisky Lounge team will then provide you with all the equipment you need to create your own blend, which you can bottle and take away with you at the end of the session. Make sure your dad’s looking dapper this Father’s Day with a grooming session at one of the UK’s top award-winning barbers, Ruffians. This Sunday, each barber shop will be giving away free drams of R&B Distillers’ Borders Highland single grain whisky to fathers while they wait for their treatment of choice. Pick from a selection of services, such as the quick beard tidy, cut-throat razor shave or haircut, complete with shampoo, condition and scalp massage. If money’s no option, then this will make a truly special Father’s Day gift for any whisky-loving dad. The Cotswolds distillery is offering the chance for fathers to visit the distillery and fill their own numbered, 200-litre American oak first-fill ex-Bourbon barrel with new make spirit. The liquid will be allowed to age for 10 years in the distillery’s bonded warehouse until it has matured into the Cotswolds’ single malt. But recipients of this extravagant gift can choose to age their whisky for as long as they want, and sample liquid from the cask with annual check-ins. Each father will receive a certificate of ownership and advice from a team of experts at the distillery. Take your dad for a dram on Sunday at the various public Scotch Malt Whisky Society (SMWS) venues that can be found in London and Edinburgh, where he’ll be able to sample the Father’s Day bottling: Funky, Feisty and Youthful. Plus, with new limited edition single cask bottlings launched every month, you can also treat your dad to a year-long SMWS membership and a 70cl bottle of the Father’s Day bottling for £80 (full membership costs £61.50 and a bottle of Funky, Feisty and Youthful retails for £49.50). If your old man’s prone to embarrassing you with his bad dad jokes, get your own back this Father’s Day with Crown Royal’s ‘Crown Your Father’ portrait service. All you need to do is upload a picture of your dad to www.crownyourfather.com and you can choose from five different regal backgrounds – all with your kingly father positioned front and centre. Poses include relaxing on a throne with a glass of Crown Royal whisky in hand, or perched on a cliff next to a lion. Once you’ve picked the perfect pose, share your portrait on social media using the hashtag #CrownYourFather. There are few matches so perfectly made for each other as whisky and cheese. This Sunday, Balvenie’s brand ambassador Alwynne Gwilt will be leading a whisky pairing masterclass full of delicious cheeses discovered during the brand’s search with Michel Roux Jr to find the top craftspeople in the UK. Whiskies will be paired with small-batch cheese, honey and bread sourced from producers including Wildes Cheese, Bermondsey Street Bees and Wooster’s, respectively. And to make sure your dad is looking über-stylish while out and about this Father’s Day, why not give him a pair of these limited edition Talisker ‘Made by the Sea’ boots? Created by British designer Oliver Sweeney, the boots are presented in a solid oak box, which comes with a 70cl bottle of Talisker 10-year-old whisky, a branded sterling silver-engraved hipflask and a compass. Only 200 pairs of the boots, crafted using Italian calf leather, have been produced.